A favorite route of local cyclists, this quiet, windy stretch of National Park highway begins near the famous Loveless Café at 8400 Highway 100 in Bellevue, and continues for 444 miles in a southwest direction to the town of Natchez, Mississippi. If you don’t have the desire or stamina to go all the way, take the 14-mile route from the entrance of the Parkway to the historic town of Leiper’s Fork, stop for Southern vittles such as homemade buttermilk biscuits and a cup of iced tea, and then pedal back to the start. Designated today as a National Scenic Byway, the National Park Service does not allow commercial traffic here, making the curvy road through the natural landscape ideal for cyclists. The route vaguely follows one forged centuries ago by Native Americans, pioneers, merchants, and mail carriers. Many historical luminaries passed this way, including General Andrew Jackson, Jefferson Davis, James Audubon, Meriwether Lewis and Ulysses S. Grant, but they weren’t riding on their own power. Cyclists agree: the road is very hilly. Be on the lookout for deer, skunk, and wild turkey families. Enjoy the spring bloom of dogwoods and redbuds. Even the road itself is a marvel. 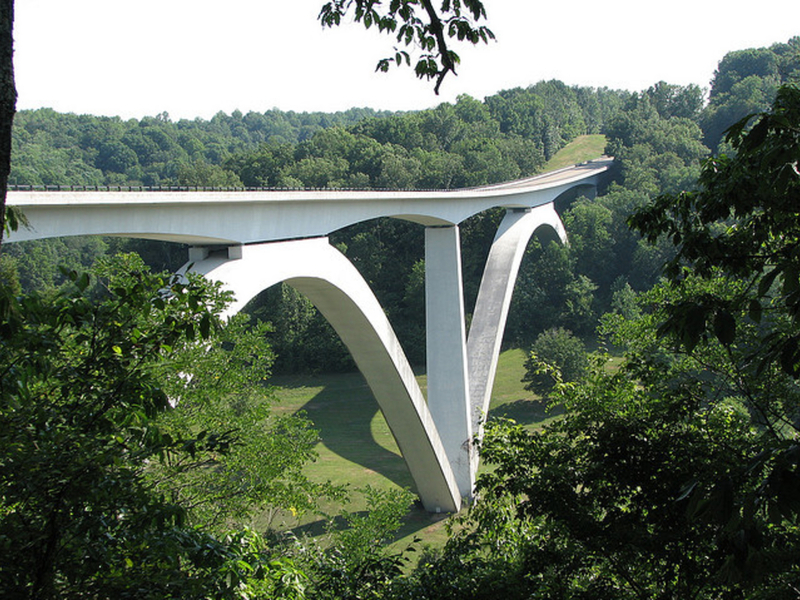 At Birdsong Hollow you’ll ride over the magnificent 1,648-foot-long concrete Double Arch Bridge, crossing over Tennessee Highway 96 from 155 feet in the air. The stunning bridge was awarded the Presidential Award for Design Excellence in 1995. After 14 challenging miles, it’s time to take a break. Exit the Trace at milepost 428 onto Tennessee Highway 46, then ride east one mile to Leiper’s Fork. The old-timey shops in the center of town take travelers back to simpler times. Don’t miss the iconic Puckett’s Grocery & Restaurant. Grab a plate of homemade Southern goodness and sit outside at a picnic table. It’s a tradition. On a pleasant Sunday morning, you’ll be surrounded by cyclists, and may be entertained with free live music beginning at noon. The Trace is a quintessential ride for cycle enthusiasts. The parkway is quiet and scenic, and the terrain provides a serious test of endurance. There are no traffic lights or stop signs - it’s always “go.” The National Park Service has designated the entire parkway as a bike route. The few motor vehicles there are must keep 3 feet of clearance from bikers, and hikers have their own trails off the parkway, making this a true mecca for cyclists. Cyclists of all abilities will enjoy the ambiance while more accomplished riders can put their endurance to the test by tacking on the miles. The milepost numbers begin in Natchez at 0 and end in Nashville at 444, so if you start at the Nashville entrance to the Trace, milepost numbers will be counting down. Bike rentals are available at Trace Cycles, 8080B Highway 100, just a mile from the entrance to the Trace. Be aware that there is no bike lane on Highway 100 for that mile. If you are driving in a car to the start, take the on-ramp to the Trace, and park in the lot about a mile down the road.